Since the election in November there has been a tremendous amount of community engagement and a stunning amount of fundraising for specific issues and causes. I know many people who have quit Facebook cold turkey because the posts have become too much. Like many people I have a love/hate relationship with Facebook. But I must have a magic algorithm on my Facebook feed, most days when I browse over to Facebook, my feed is filled with people in Pittsburgh and all over the country working on community projects. There are a lot of folks who have been doing things to make Pittsburgh, Pittsburgh well before the election and they will likely keep working on those things through the next election. One of the things that I like most about writing about Pittsburgh is the opportunity to connect more Pittsburghers to to Pittsburgh places and organizations. There are so many people and organizations that are quietly working to make this city, well, more Pittsburgh. The goal: Feature 100 People and Organizations working to make Pittsburgh a better place for everyone. Help us feature 100 different ways to love Pittsburgh. Events, volunteer opportunities, articles, and anything else that helps to connect the neighbors in this city to the people and organizations that are working to make this city a better place. The idea to build a list of 100 things that people are doing to make Pittsburgh better was inspired by a few things. Valentine’s Day – I started thinking about this back in January, but last week’s celebration of love brought this idea back into focus. 100 Days of US – After the election, The Sprout Fund launched a program called 100 Days of Us @100daysofus, which invited Pittsburghers to submit ideas for projects for people to act locally. Over 150 ideas where submitted and the community came together to vote on the ideas. Using the community votes the Sprout Fund gave away $120,000 to 27 of these community projects. There were many ideas submitted and there are many other organizations that in Pittsburgh that have stories to share. Connecting people to community – Over the past few weeks, and again this morning, I had a conversation with someone who wanted to see a change in their neighborhood but didn’t know where to find help. As soon as they shared the idea, I was surprised they didn’t know about another organization that was already working on something similar. I have a spreadsheet with a list of organizations and events, but I would love to hear more ideas from all across the city and beyond. What is happening in your neighborhood that others should know about? 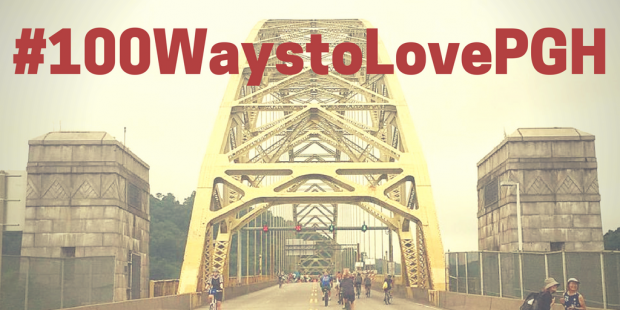 Please leave a comment below or share a post with the #100waystolovepgh hashtag.